Albert van der Sel : The exponential and ln() functions. In the series: Note 7. Subject: The ex and ln(x) functions. So, I am really not sure of it, but I hope that this note can be of use. This note: Note 7: The ex and ln(x) functions. Please be sure that you are on a "level" at least equivalent to the contents up to, and including, note 6. It is important for one of the next notes (note 10). especially the function ex often plays an important role as a solution. 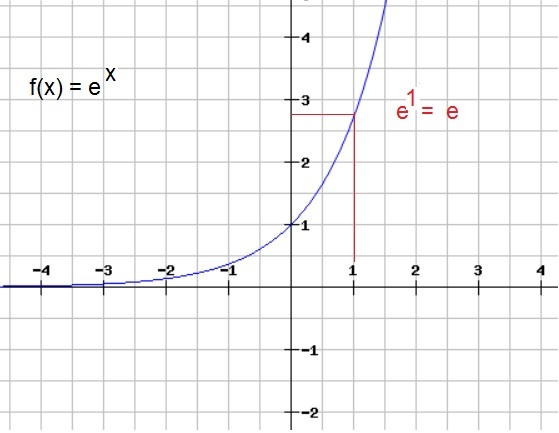 The following sort of function might seem strange at first sight, like y=2x, or y=5x etc..
One thing seems to be sure when you see such a function: when "x" is positive, those functions will rise steeply. or, which we will also see in this note, the number "e". The number "e" is close to about '2.7', but the fraction behind the dot (or comma), never ends. As a "reasonable" aproximation, the number 2.71828 is often used in many calculations. When you can keep it simple, then simply just 2.7 is used as an approximation. The number "e" is important in Physics and many other sciences. important element in. But let's first start with functions in the form "f(x)=2x". 1.1 A few remarks on general exponential functions in the form f(x)=bx. the sin(x) and cos(x) functions etc.. Here we will meet a new class of functions, namely f(x)=bx, where "b" is some constant number (like '2'). just a few points, already gives a reasonable picture on how the function "looks like". Can you make a similar table for f(x)=5x ? and when x=6, then f(x)=106 = 1000000. 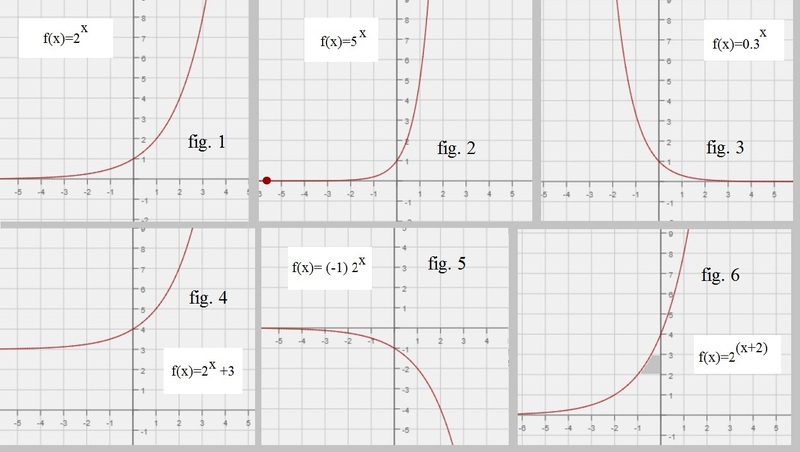 - If 0< b < 1, then a function as f(x)=bx has a shape similar to the right curve in figure 1.
that if x=2, then f(x)=0.32 = 0.3 x 0.3 = 0.09, and if x=3, then f(x)=0.33 = 0.3 x 0.3 x 0.3 = 0.027. - Note that those functions exhibit aymptotic behaviour. They never reach the x-axis completely, but they get "nearer and nearer". 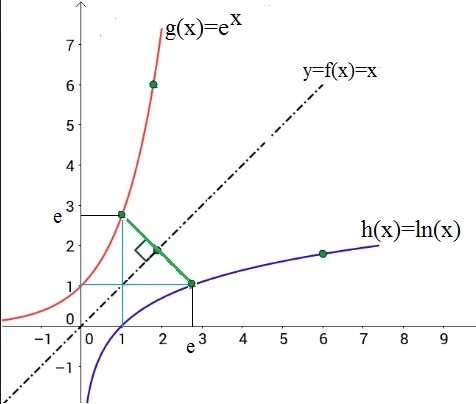 For a example, for an exponential function with b > 1, then when x approaches "-infinity", then f(x) approaches '0'. Or, lim x → - ∞ f(x) = 0. 1.2 The exponential function f(x)=bx when "b"=e. As as graph, f(x)=ex is quite similar to the graphs we have seen above (where b > 1). So, you might say that we have not much "news" here. Ofcourse, when x=1, we have f(x) = e1 = e.
Note in figure 2, that e is about 2.7. 1.3 Some background on "e". the outcome "converges" to a very specific number. Today we call that specific number 'e'. lim n → ∞ (1 + 1/n)n = e.
Let's do some calculations. If you would calculate (1 + 1/10)10 then we have 2.59.
if you would calculate (1 + 1/100)100 then we have 2.70. You see, if we only take n=100, then we are already pretty close to the "true" 'e'. You get more and more closer, the larger 'n' is. People with a background in economics or accounting would see a rather familiar formula. It resembles the formula when you set away an amount of money, to a certain rate of interest, for period of "t" (n). The formula "(1 + 1/n)n" seems to be fundamental to describe a sort of accumulated growth with a constant interest rate. Yes, but what about physics? Just too much examples are available. Here is one that that also resembles the above. which is a very high number of such nuclei, each have a (general) expectation value to decay. that you stare to it for several years. But on average, each nuclei has a good chance to decay in about 6h. The "half-life" is defined to be that time, that halve of the material has decayed (with a very high probability). In this case the e -kt factor, resembles the utmost right curve in figure 1 a bit, as of x > 0.
all sorts of events where an "ensemble" growths or diminishes. What is that with "e"? I don't think it's only math or physics. I bet that it's a matter for philosophy too. 2.1 Inverse function in general. Suppose you have the functions u and v, in such a way, that u(v(x))... is x again ! Then u(v(x))= √ (x2) = x.
are applied, then nothing happens to "x". The funcion "u(v(x)" maps "x" onto itself. Then people also often say, that "v" is the inverse function of "u", and the other way around. but the use the f anf f-1 notation. The functions "f" and " f-1" are both each others inverse function. where I is the Identity operator, or "the doing nothing" operator, which nicely sums it up. Let's plot both √ x and it's inverse x2 in the XY plane. thus for example f(f-1(x))=x, means that f(f-1(x)) really is the same as y=x. 2.2 ln(x) as the inverse function of ex. the logarithmic function using the number '10' as it's "base", is very helpful. A couple of examples may illustrate that. The "claim" here, is that if g(x)=ex, then it's inverse function is h(x)=ln(x). But, if that is true, then h(x)=ln(x), must be the inverse function of g(x)=ex. We know how the the curve of ex looks like. Then, the inverse function must be the mirror with respect to f(x)=x. Indeed, ofcourse it's possible to draw such an inverse curve, since you only need to mirror ex in f(x)=x. Sure, it would be great to prove it. However, I can't prove it right now, since I like to do that using a primitive function. 2.3 The derivatives of ln(x) and ex. Ofcourse we need to know the derivatives of both functions. It's important to know, that the upper equation really is the "heart" of finding derivatives. If needed, please check note 5 again, where the relation is fully explainend. Remember from note 1, that an+m = an am, where a can be any number. Note: Do you see that we have managed to pull out ex from the Limit? This fact, that the derivative of a function is itself, has amazed countless mathematicians and philosophers. So, it might be argued, that it's very remarkable status, should not surprise us at all. Note that the function 1/x, shows asymptotic behaviour if "x" approaches "0". We have seen 1/x before, so we were already aware of that fact. That's it ! Hope you liked it. The next note is a super quick intro on the "primitive integral" and "primitive functions".